We’ve seen The Littlest Libraries of the Future. Now, what do the largest libraries look like? And what will changes they’re making mean for books? Check out this short video from Mansueto Library at the University of Chicago. Careful! One glimpse of these new-fangled library stacks may give you vertigo! The Mansueto library in Chicago houses three and a half million books underground by using an automated storage and retrieval system (ASRS). ASRS systems organize materials in bins rather than bookshelves. As its video shows, the bins at Mansueto are stored in arrays of racks 50 feet high. 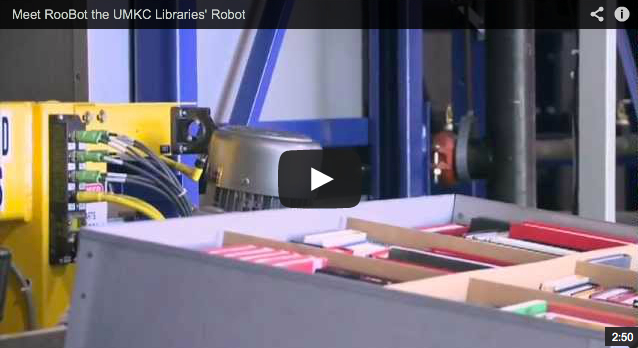 Giant robotic cranes can locate and deliver books to patrons “almost instantaneously”. Maximum Flexibility. By incorporating the retrieval system into the building design, the library achieves the maximum capability to house, protect, and access library materials well into the future. Greater Holding Capability. While much of the library collection will be on open shelving, the retrieval system accommodates an additional 750,000 volumes onsite. Earthquake Safety. The retrieval system was designed to exceed standard earthquake building standards. Expansion. The retrieval system is designed with advanced technological capabilities that can be upgraded and expanded. Cost savings. The retrieval system eliminates the need and cost for offsite storage facilities. Why is Automated Storage and Retrieval important for you to know about? ASRS systems may literally change the shape of print books! In my guide Marketing Your Book to Libraries: An Insider’s Guide for Authors, I discuss the way library bookshelves have impacted the size requirements for print books. All libraries use standardized sizes of bookshelves. If your book doesn’t fall within the height-range of a standard library bookshelf, it will be classified as “oversized”. This isn’t a good thing! in general “over-sized” print books in libraries are things like gazeteers and atlases, books of maps which in print format need to be much larger than a typical bound book in order to be both readable and useful to library patrons. Some map books I worked with are over three feet high and two feet wide! Oversized bookshelves usually wind up in out-of-the-way corners or back hallways in the library. This means that odd-size books are much less “accessible” by the reader. Readers who peruse the standard-size shelves won’t discover odd-size books on them. Patrons will have to find these books in the library catalog first and then locate the out-of-the-way places where oversized books are shelved. Two partially-mechanized systems have supplanted standard-size bookshelves in quite a few libraries. However, these systems have not changed the banishment of oversized books to the library boondocks. Compact moveable storage shelves are metal and extremely heavy. To move the closed shelves apart, the patron either pushes a button or manually turns a large metal wheel located on the end of the bookshelves. Either way, it can be a bit scary if you find yourself in an aisle where the shelf starts moving! Small libraries pressed for space tend to use compact storage systems with moveable shelves. Larger libraries tend to use high-density storage systems. 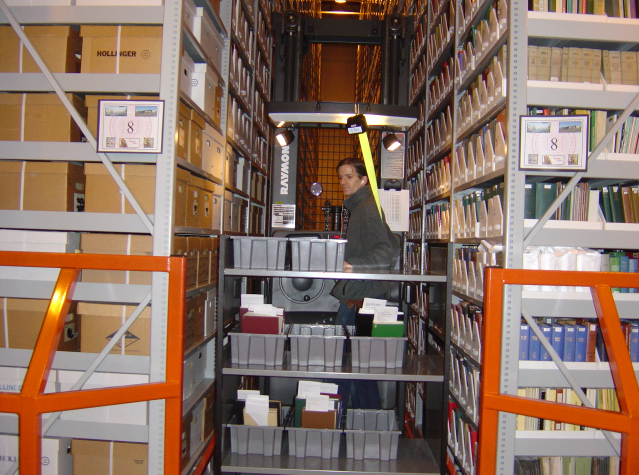 Below is a photo showing a library staff member retrieving books from a high-density storage system at Indiana State University at Bloomington. As you can see in the first photo above, huge ASRS bins can hold books of widely varying sizes. Unlike its predecessors, ASRS doesn’t “discriminate” against “oversized” books. ASRS stores and retrieves all sizes of books the same way. What does this mean to you? If ASRS storage becomes more popular with academic and public libraries, you may be able to design your print book(s) using a variety of sizes that are rarely used for print books produced today. Authors, publishers and book designers – get ready to be more creative! Of course, there is a downside to fully-automated ASRS systems – no one can browse the books because they are stored in bins within the automated system. This has huge implications for both the indexing and the marketing of print books.